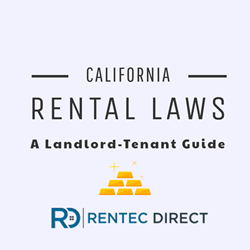 Recent disasters in California have left many homes destroyed and uninhabitable; property management software company, Rentec Direct, calls on recently published guide to help navigate housing laws and regulations. California landlords and renters affected by the recent fires can begin the road to recovery by reviewing California housing laws. While it will take some time to recover from such a significant disaster, many are starting to think about rebuilding and reclaiming their homes. Landlords and tenants can find a good place to start this process by understanding the laws and regulations already in place in the state. Rentec Direct, the leading property management software solution for real estate professionals, provides resources for tenants and landlords in California following the devastating wildfires in the region. As people begin to look at rebuilding and recovery from the loss of more than 40 lives, an estimated 8,000 structures and more than 245,000 acres of land, it’s important to take a closer look of California housing laws. Rentec Direct released a complete guide on this topic earlier this year. According to risk modeling firm RMS, losses in residential real estate from the disaster to have affected a total of 16,000 buildings (in and around the perimeters of the fire activity) estimated at more than $11 billion in damages. This will have a huge impact on homeowners, in addition to those who own investment properties, their property managers and their tenants. Personal Property: Landlords are not typically responsible for the loss of personal property of a tenant after a fire, unless the tenant can prove landlord negligence. If the tenant has renter's insurance they can follow their insurance company's procedure to file a claim against any property loss or damage caused by the fire.